The greatest sign of success for a teacher is to be able to say, "The children are now working as I did not exist." The Montessori method of education which emphasizes the potential of the young child and which develops this potential by utilizing special teaching materials. Montessori materials help the child to understand what he/she learns by associating abstract concepts with concrete sensorial experiences. 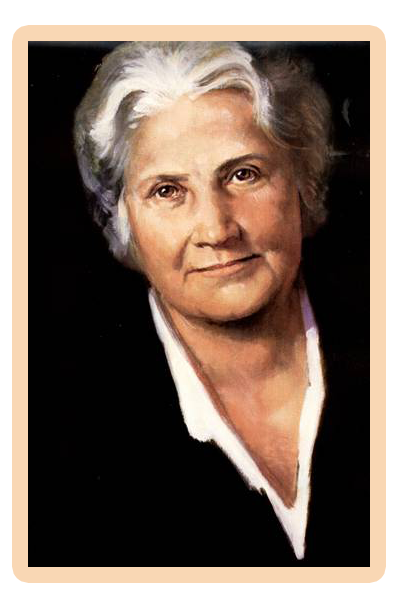 Dr. Maria Montessori (1870 – 1952), an Italian physician and educator, was the founder of the educational philosophy which still bears her name today. She based her philosophy on the premise that education involves the unfolding of the abilities which a child possesses at birth. She emphasized that a child learns best if given freedom to discover, explore and create in an enriched environment under the guidance and encouragement of a trained directress (teacher). Montessori designed specific learning materials for the classroom environment, but also believed that her method should be open-ended and encouraged innovation and growth based on observation of the child. The Montessori School of Corona is dedicated to the philosophy that isn't always talked about, but is still applicable and still as strongly practiced in the classrooms now as it always has been: "The Child Comes First." We, as teachers, all need to remember this conviction. This is what sets aside good Montessori teachers from others. We are able to bring to the classroom something fresh each day, something from which the children can see and feel and grow. We remember that each and every child needs and deserves respect. That is why a Montessori teacher will speak to the child in his/her class with respect and discipline is low-key. At times the situation can be trying as well as tiring, yet each time the Montessori teacher digs a little deeper for the patience and understanding of that one child who needs extra attention. This dedication of the Montessori teachers, especially of our teachers, is what makes the method applicable and so valuable. We have an excellent reputation and the administration will always strive to maintain it by employing only the best and most dedicated teachers.